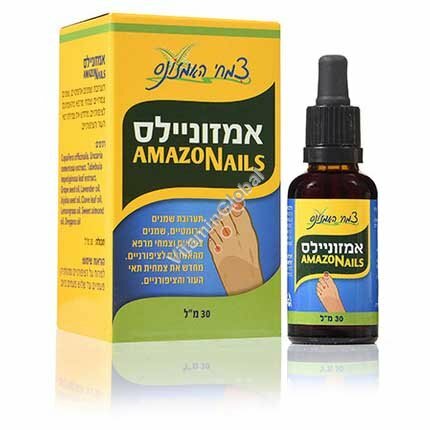 AMAZONails is Alchymist's leading product for the treatment of chronic nail fungus. AMAZONails uses a complex mixture of aromatic oils, plant oils, and natural herbs. Copaiba oil: This is the main ingredient of AMAZONails. This is a natural oil (technically an oleoresin) produced from the Copaifera reticulata plant, which grows in the Amazon rainforests of Brazil. Copaiba oil is considered one the most effective treatments for fungus of the fingernails and toenails. The oil contains a high concentration beta-carophyllene, a highly active anti-fungal agentl. Not only is copaiba oil the key ingredient of AMAZONails, it is also effective at disinfecting and healing cuts and scrapes. Copaiba extract: The flesh of the copaiba plant itself contains phytochemicals that also help in the treatment of nail fungi. Cat's Claw extract (Una de Gato): Cat's claw is a plant which grows in the Amazon rain forests of Peru and has strong anti-fungal qualities. Jojoba oil: Jojoba oil protects the skin against dryness and acidity as it contains many antioxidants, well known for blocking the damage otherwise caused by free radicals. Clove oil: an excellent, natural anti-bacterial, anti-fungal, anti-oxidant, and anti-inflammatory. Lavender oil: a natural antiseptic, Helps heal cracked skin, restores damaged tissues, and stops bleeding. Enhances the activity of other oils that come in contact with it. Lemon grass oil: a natural anti-bacterial and anti-fungal. Oregano oil: a natural fungicide, oregano oil also suppresses the growth of bacteria, viruses and parasites. Almond oil: This oil is the most common of the base oils. Almond oil is absorbed quickly and leaves the body feeling soft and pleasant to the touch. Almond oil also heals and nourishes the skin. Grape seed oil: soothes the skin. Directions: Apply to tops of nails as well as underneath and on the cuticles, two or three times daily. Pregnant women, breastfeeding women, people taking drugs and parents treating children - consult a doctor. This information is not medical advice and not indicatory. In case of a medical problem, contact your doctor.